Spend a day at Pearl Harbor without ever waiting in line, and customize the time you'd like your driver to meet you at your hotel. With this 8-hour, private tour of Pearl Harbor, you'll skip the line at the USS 'Arizona' Memorial and also visit the USS 'Bowfin' and USS 'Bowfin' Museum. Complimentary headsets are provided for many of the attractions you'll visit in Pearl Harbor, and finish the day with a driving tour past popular Honolulu sights. This tour begins at whatever time you'd like to head to Pearl Harbor, as this completely private, chauffeured tour is centered around your group's schedule. Your driver will meet you in front of your hotel, where you'll then be transported in luxury and comfort to the entrance in front of Pearl Harbor. There's no need to wait in line once you get there, since your entrance tickets and vouchers for the day have already been arranged. A coordinator will meet you with a bottle of water and refreshing, tropical juice, and provide an orientation about the multiple sights in the area. 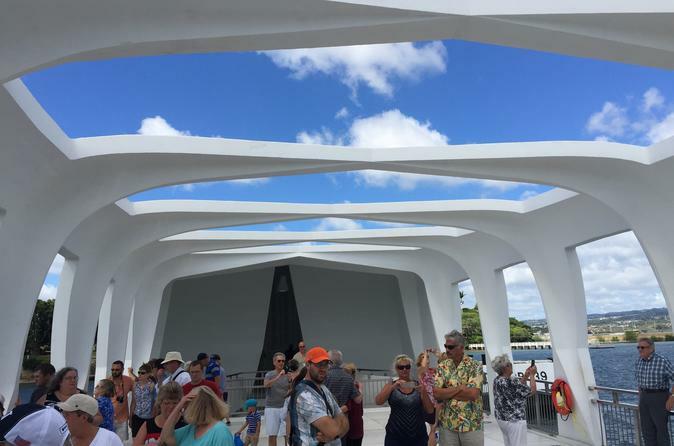 Spend time exploring the Pearl Harbor Visitor Center to brush up on background history, and when you decide to visit the Arizona Memorial, you can skip the line and go directly to riding the boat to the memorial. Your day continues when you step aboard the USS Bowfin submarine, where you'll tour the boat with a complimentary headset to learn more about life underwater. You'll also receive a headset when continuing the tour at the USS Bowfin Museum. Throughout the day you'll experience the horror and history of World War II, from video footage of the Japanese attack, to the chance to touch a ballistic missile like those that are stored on subs. After you've paid your respects at Pearl Harbor and have visited most of its sights, you'll meet back up with your private chauffeur for a drive past many of Honolulu's most popular visitor attractions. See the statue of King Kamehameha and 'Iolani Palace, and your tour officially comes to an end when you're dropped in front of your hotel.